PlaytimeShow.com updates: New forums, new look! PlaytimeShow.com has gone through a re-design. Take a look at what’s new! With Playtime Season 3 airing on Halo Waypoint, some of you might not have visited the official Playtime Homepage in a little while. The site has gone through some changes lately, so here’s a quick rundown of what you’ll find when you visit the new PlaytimeShow.com! PlaytimeShow.com now has its very own forum. With such a great community growing around the series, a community forum really was inevitable. Playtime fans now have a place to come and talk about their favorite machinima series! The Playtime Forum features 4 main categories. Welcome! – In this section you can introduce yourself to the rest of the community, read up on the latest Playtime related news and updates, and find the PlaytimeShow.com Forum Rules. Playtime – Come here to discuss anything and everything about the Playtime Machinima series. Machinima Corner – The Machinima Corner is the place to discuss anything related to machinima, from technical questions, to posting and sharing your latest creation. 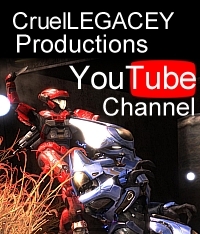 Recruiting – This section is for machinima makers looking for help with their latest production. If you need voice actors, body actors, editors, or composers, this is the place to find them. So go visit the new PlaytimeShow.com and take a look! While you’re there, you may as well jump into the forums and say hello to the rest of the community. This entry was posted in halo reach, Playtime, Playtime News. Bookmark the permalink.